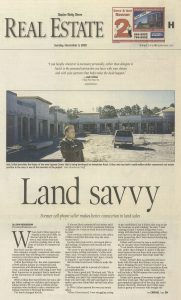 This story was published in the Naples Daily News in Jack’s early days in the development industry. This article was published November 3, 2002. Opening sentence: When Jack Crifasi moved to Naples in the mid-1980s, he had no idea he’d one day own a real estate firm that would be making tens of millions of dollars in commercial deals. But that’s exactly where he is today. Photo Caption: Jack Crifasi describes the future of the new Uptown Center that is being developed on Immokalee Road. Crifasi, who has built a multi-million-dollar commercial real estate practice in the area, is one of the investors in the project.